My youngest daughter and I were grocery shopping yesterday. That in itself may seem unremarkable. But, in the course of the conversation as we were wandering up and down aisles, she reminded me of something. Allow me to share . . .
Our family is large. In a couple of ways. Six kids, most of whom are over six feet in height. When they were all still home, these large people ate large meals. Back then, our supplies were, justifiably, bought in bulk. It was a necessity if one didn’t want to shop for groceries every. Single. Day. Sooo . . . bulk. To us, it was a normal way to live. Peanut butter, miracle whip, honey, pickles, salad dressings, oil, margarine and other foods by the pail. Ketchup in a bag. Soups in gallon containers. Large quantities were deposited in the cold storage according to directions. Then small containers were filled from larger containers and kept in the kitchen for easy access. By the time the younger kids were helping with meal preparation, this had been the ongoing practice for as long as they’d been alive. Even the older kids had forgotten their ‘long-ago’ when food was purchased in normal sized containers. “That goes without saying.” For that comment, I got ‘the look’. 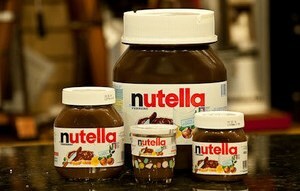 Life comes in all shapes and sizes. Small, medium, large. Extra large. The trick is finding which you need. Labels: Small medium and large. 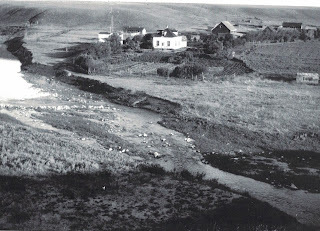 Old Ranch. The barnyard is out there. Near the . . . ummm . . . barn. My very first ranch memory occurred when I was two. I had my new little red cowboy boots on. I was ready for anything. Dad was out in the blacksmith shop and I knew he would be happy to see me. Certainly, I would be happy to see him and though there was a fence and a large barnyard between us, I decided to make the journey. I'm afraid I rather discounted the importance of . . . the Cow. Oh, I knew she was there. I just didn't think it was important. It was the custom in those days to take the calf away from the milk cow and only put the two of them together morning and evening, after the cow had been milked. That way, the cow’s production stayed very high, we were assured a constant supply of milk, and the calf received enough to ensure its proper growth. A good system all around. Except that one usually ended up with a rather irate, over-protective full-grown mama cow wandering at will in the barnyard. No problem. If you were an adult, or very fast. I probably don't have to tell you - I was neither . . . I don't know what it is about little children. But cows seem to think they are something dangerous. A dog, perhaps. Or a coyote or wolf. I do know that this particular cow spotted me the moment I came into view. And went into instant I-must-watch-this-creature-because-I-have-a-baby-and-who-knows-what-said-creature-may-do mode. I stood just inside the gate and watched her. She looked . . . nervous. Twitchy. Perhaps what she needed was some conversation! Having been raised to nearly three on a ranch, I was fully confident of my ability to speak cow. I walked over to the fence, put my face against the bars of the gate and proceeded to bellow impressively. I don’t know what I said, but it must have been interesting because the cow began to make noises of her own. And then she started running feints at the gate. Being two, I thought she was merely trying to amaze me. I continued to ‘talk’. She continued to react. Finally, in a positive froth, she pounded over to the barn to make sure that her baby was still in his pen, unharmed. The way was clear for me to climb the fence and cross the no-man’s (or children's) land that was the barn yard. I proceeded to do so. I probably made it a few yards before she hit me. I don’t remember much about that part. My mother takes over the story from there. She had been working in the kitchen and keeping an eye on me through the window. She had seen me standing beside the gate. Suddenly, as with any toddler, I disappeared. She didn't waste time in searching. She knew instinctively where I had gone. She started out on the run, spotting me just as I dropped down from the fence in triumph. Mom’s sight was obscured for a few moments as she ran. By the time she again had me in her sights, I was down and the cow was turning for a second engagement. Mom leapt the fence at a single bound (maybe she opened the gate and ran through, but this sounds better) reaching me just ahead of the black and white frenzy. She scooped me up and screamed for my Dad, while the cow tried to knock me out of her arms. For a few seconds, Mom avoided the angry, gesticulating cow by spinning, pirouetting gracefully. But soon, the cow tired of the performance and changed tactics. She decided that the best way to the child was through the mother. Fortunately this new ‘barn(yard) dance’ with me at the centre was cut short by the arrival of my enraged father. When anyone, or anything, was threatening one of his children, my dad would . . . well let me put it this way. Needless to say, in short order, the cow forgot all about her ongoing problems with me and headed for the nearest far-away place with her tail tucked – figuratively speaking – between her legs, while a tear-stained toddler was being closely examined by two anxious parents. My only injuries were a couple of bruises and a red cowboy boot crushed flat. My sense of adventure remained unscathed. In 1979, Husby and I moved to Winnipeg, Manitoba, so he could complete his Master’s degree in history. It was an interesting, eye-opening experience for a girl who had never been off the ranch for more than a few days. We were there for eight months. It was as long as I could be away from my beloved Alberta prairies. But moving back to Alberta necessitated some commuting back and forth as he completed his thesis. These trips, a necessity for him, were pure holidays for me. One, in particular, stands out . . .
We had packed up another couple, parked our kids with our respective mothers, and headed out. It was a joyous, happy group that talked and laughed our way across Alberta, Saskatchewan and Manitoba. One evening, the four of us camped at Buffalo Pound Provincial Park, an historic buffalo hunting site just outside of Moose Jaw, Saskatchewan. (Yes, there really is a place called Moose Jaw.) Years ago, native hunters used to drive herds of buffalo into the bogs in the area, dispatching them easily as they struggled in the mud. Remember where I said that Husby’s thesis was in history? Well, that would become important here . . .
Because such sites are good places to find artifacts. Husby’s favourite pastime. And what else would one want to do when holidaying? Immediately after setting up camp, the two husbys set out, most notably looking for arrow heads. We wives stayed at the campsite, visiting, preparing the evening meal and generally enjoying the outdoors and the fact that we weren’t sitting in a car. About half-an-hour after they set out, our Husbys returned. With broad grins denoting success. 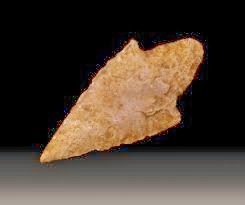 “We found an arrowhead!” they announced. “Really?” Okay, we wives were a little bit surprised. Pleased for them. But surprised. A hand was extended and there, in the palm, was indeed an arrowhead. Rubber. With a suction cup on one end. Carbon dating is ongoing . . .
Labels: Who knows what can be found? Sometimes, walking softly and carrying a big stick isn’t all that effective. Uncle Leif, then eight or nine years old, had been assigned to go to the field and retrieve Sorrel. I should probably tell you that Sorrel was a flashy-looking, reddish-brown mare. A passably good cow horse except for a couple of glaring faults. Faults that involved teeth and hooves. Sorrel liked her own company. And only her own company. When other horses came too near, she would bite or kick viciously. Woe unto anyone trying to bring her in from the field. She would wait until the climactic moment, then let fly with both hind legs. One had to be especially vigilant to avoid skin and/or bone-breakage. On this particular day, Leif, mounted on poor, long suffering Shorty, tried for some time to manoeuvre/avoid. It was a tricky task. Finally he grew tired of Sorrel’s ‘shenanigans’. Returning to the farm, he found a fifteen foot pole-vault pole (On a farm with eight brothers, such a thing was entirely too common). This ‘lance’ would allow him to herd the mare while staying happily out of reach of anything sharp or bite-y. Thus armed, he returned to the field and his arch-nemesis. 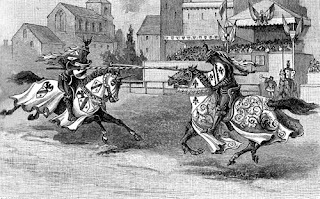 Moving stealthily into position near the grazing mare, he grasped his weapon by the very end to allow for the greatest safety margin, raised the pole into the approved jousting/poking position . . . But before he could get close enough to contact his victim, said victim took to her heels. Not one to be outdone by such an obvious manoeuvre, Leif, lance still raised, urged Shorty to increase his pace and follow. Now all would have been well except for one thing. Leif was holding the pole by the very end. Arm extended for greatest reach. Control was fast becoming a problem. 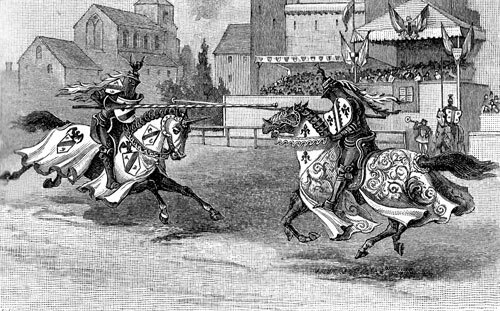 Just as he was pulling the reins to stop his horse, the lance tip . . . dipped. And poked into the ground. Launching Leif spectacularly into the air. He landed some feet away. Fortunately, the only damage was the loss of air from tortured lungs. After some minutes, he recovered both air and equilibrium. But lost all inclination to complete his assigned task. Sorrel, happily munching grass, watched him go. Labels: When 'walking softly and carrying a big stick' backfires. 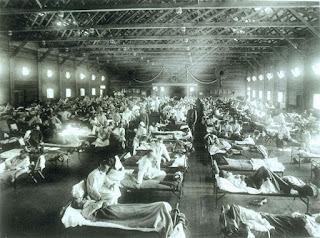 The influenza pandemic of 1918-1919 killed more people than the Great War, known today as World War I (WWI), at somewhere between 20 and 40 million people. It has been cited as the most devastating epidemic in recorded world history. More people died of influenza in a single year than in four years of the Black Death Bubonic Plague from 1347 to 1351. Known as "Spanish Flu" or "La Grippe" the influenza of 1918-1919 was a global disaster. My Grandmother, Sarah Lovina Stringam was the nurse in the tiny town of Glenwood, Alberta. Called upon for everything from bruises and scrapes to severe frostbite, she became accepted as the hands and knowledge that made the difference between life and death. Then came 1918. The Great and horrible war was finally winding down. The Spanish Flu epidemic was just getting started . . .
“I did quite a bit of nursing during the year of the flu epidemic, both for the family and for the neighbours. It was frightening because there were so many deaths, especially women who were pregnant. One of our hired men was the first to have it at our house. I kept him in his room and wouldn’t let him out until he was over it. My husband took it next and I kept him isolated from the rest of the family until he was well. He was just over it when Lono Brown, one of our friends, came to see if I would help him with his wife. Lono’s first wife had died a few years before, leaving him with two small boys. He had married a young widow from Utah with two small girls. They had been married less than a year. I told him, when he came for me, that I was still nursing a baby and would have to come home every four or five hours for that. There was only one telephone in Glenwood, a toll office at the home of Edward Leavitt. He took me to the telephone and we talked to the doctor. The doctor was getting only two to four hours sleep a day and just couldn’t keep up with all the calls. He told me what to do and said he could come as soon as he could. For three days, I went to the Brown home and did what I could. Every few hours I would go home and drop my clothing into a box in our wash house to fumigate them. Then I would change into clothing I kept in another box and go into my home to nurse the baby and see how the household was managing. Eldest daughter, Emily was twelve at that time. On the fourth day, Sister Brown, who was six months pregnant started with labour pains. By this time the doctor had come. He stayed for a while but it looked like it would be some time before the baby came and there were other people needing him so much so he decided he had better go. Right after he went it looked as if things were going to happen so I asked Lono to go for a midwife, Sister Newby. She came and delivered the baby, who was stillborn. She said because she was a midwife she was not allowed to handle a dead body. She told me how to wash and prepare the baby for burial and when I had finished, she went home. The next few hours were hard. I kept praying that her [Mrs. Brown’s] life would be spared because of the children and because she was so far away from her old home and her people but she kept getting weaker and weaker. She died about six hours after the baby. Sister Newby came back and told me what to do to prepare her for burial. What a truly heartbreaking and terrifying experience. I admire my grandmother and others, like her, who simply ‘carried on’ and made all the difference in their world.